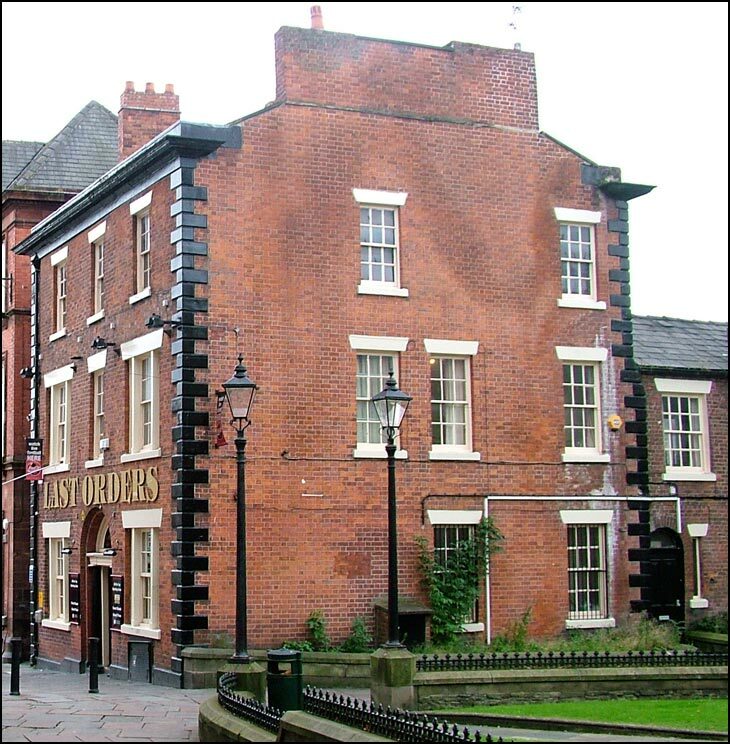 Originally the Dog and Partridge, then the Bees Knees, taken from within the grounds of Wigan Parish Church. Note the lanterns, old property at the rear (does anyone know what this is?) and damp within the chimney breast. The old property at the rear is part of the upstairs living area, further back it also has a balcony/terrace that goes over the top of the pubs kitchens. The black door you see enters the premises to the rear of the bar area. I worked here in 2004 when it first opened in 2003 as Last Orders. Very appropriate name as the developers probably have their eye on this and every other building right down to Wallgate Bridge. Brian, this a great photo of the pub. I must have walked passed it hundreds of times and not really seen what an attractive building this is. So, for me the photo has brought it much more alive, especially when we find out a bit more of the pub from people who worked there. Yes, I like this kind of photo, but some of our Town Centre buildings are a disgrace, I'm sorry to say. It is very damp at the side. I haven't been in there since it was the Dog and Partridge, but I remember there was a corridor down the back of the pub from the bar area and there was cosy little lounge areas leading off it, so I take it they are no longer there. I remember Eric who was the landlord in the 70s. Fantastic days when it was The Bees Knees, like many pubs in the town it suffered through being "done up", whatever happened to the phrase "If it ain't broke, don't fix it"? Thanks David, I couldn't recall the landlords name, he served an excellent pint too. Was Eric, the landlord in the 70's Landlord of the Stag at Orrell Post before he moved to the Dog and Partridge?